After a few great long runs of 15 and 18 miles, the Monday before I set out to head to Charleston, South Carolina with my college friends to celebrate our 40th birthday, I planned on running 20 miles. I was on a high after the 18 miles the week before, and figured I wanted to spent the time with my girlfriends in Charleston eating, drinking, and celebrating instead of thinking about running. The Sunday night before the run, I had started to feel remnants of a cold. After training my 830am client that Monday morning, I ate my “ritual pre-long run” meal of a banana, peanut butter on whole wheat bread, and sat out to run. Somewhere between mile 10-11, I wasn’t feeling great. 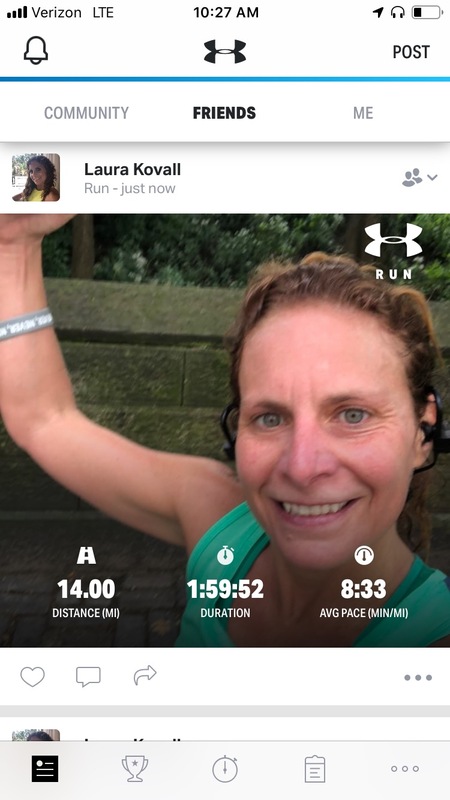 I was pacing 8:30 min/miles so I was happy with that, but I was achy, and my muscles seemed to be losing stamina and not because of running fatigue. Do I push forward? Or, still at that point 6 weeks out, do I stop, recognize I did run about 10 and a half, call it a day and set out for my 20 miler at a later point? To be the best you can be, you need to challenge yourself. If training for a marathon, you need to put on the milage. You need to work on the mental challenges and not quit, even and most importantly when you feel like it. That being said, rest and recovery is equally important. And while running on tired legs is part of the training, tired legs can also inhibit form, and you may find yourself straining muscles or overcompensating where you should not. And, yes, this is where injuries may occur, thus sidelining you from your main event. There is no secret sauce to know when to push and when not to push; there is some trial and error as every body is literally different. This is why, when I train both my clients and myself, I do a ton of cross-training. Working the body in multiple directions engages and develops muscle strength and endurance across the entire body, thus minimizing fatigue or the threat of injury since the body as a whole is strong and balanced. For me, when I am marathon training, I run NO MORE than 4 days a week, and I recommend this protocol for my clients. The Balance: What does a Torn Meniscus and and a Postpartum Body Have in Common? Since May, my private client roster has grown. I love group fitness; the energy leading a group is second to none, and even in a group setting I am able to analyze and dissect my clients form, bodily instabilities, and guide them towards exercises that will strengthen not only the whole body but will be tailored to their needs. However, with privates, we can take this a step further. Recently, I have been working with a client who tore her meniscus a few months ago. She is determined not to have surgery, and we have been working together in order to strengthen the area around the knee so she can tap into those muscles and put less strain actually on the knee. And yes, this is a balance because the very exercises that can help her are the very exercises that can be destabilizing, causing her to lose her balance or restrain the location of the tear. On a recent Friday morning session, she was feeling great. And we did “everything” minus the impact. I gave her unilateral balancing work, squats, plies, side lunges, the works. I continuously checked on her pain. She continuously told me she was all good. A few days later, her knee was bothering her. I scratched everything we did that Friday and stuck with non-body weighted ways to work the muscles around the knee. When I entered the fitness world five and a half years ago, I primarily worked with new moms. While child birth and pregnancy is a very “normal and natural” event, it truly does wreck havoc on your body in ways that one does not even know until either first hand experiencing or working with a post-natal client. Between the usual separating of the abs, a weakened pelvic floor, not to mention the destabilizing hormones which loosen your joints, working out postpartum is an entirely different experience. This does not mean it will always be different; it simply means that, especially right after baby, these issues need to be considered. Similar to my client with the meniscus tear, training the recent postpartum is a constant balancing act. For clients who have diastasis (separation in her abdominal); how best to work the core? For clients who are still nursing and have relaxin causing their hips and joints to be less stable, do we do impact like running or jumping or not because they are more prone to fall? Does it depend on the fitness level pre-baby or is that not relevant? When it comes to all of these questions, the very exercises that can help strengthen the muscles needed can also harm the muscles. So again, what do we do? So what did I do that Monday morning? I called it. I decided not to push on. I banked the 11 miles. Full disclosure; I have been “in my head” about it. Did I make the right call? As I finish this newsletter on a Friday morning in Charleston, after a 9 mile run in sweltering, unforgiving heat, after a night of not drinking much but eating more deliciously rich and fried food than I have probably all year, I am ruminating over the fact that I have not had a good long post 15 mile run since the 18 miler. I am remembering the mental blockages I had last year where I would just “stop”. The negative self talk is there. The doubt is there. And, as I write this, I got a text from a client and friend of mine, an accomplished marathon runner. She may have a hip fracture, which will sideline her from the main event just shy of 5 weeks out. Fingers crossed that she does not. I let this information settle. Stopping was the right call. And Update! Day I got back from Charleston, I got 14 in pacing 8 min 33 seconds per mile. And I felt good doing it.